Arthur goes to the Wapiti Reservation to speak with Rains Fall. He wants to show Arthur a sacred location in the mountains but the Army appears to have found it already. Note: This is an optional mission (accepted during A Rage Unleashed) but will show in the Rockstar Games Social Club as missing if not done. It will automatically fill in after completing the game's story. Enter Rains Fall's tent at the Wapiti Reservation. He welcomes Arthur who doesn't sound well. Arthur thinks he is dying. Rains Fall knows Arthur went on the raid with his son Eagle Flies. Colonel Favours already enacted revenge for it. Two women were assaulted by his men. Arthur is sorry. Rains Fall disagrees with his son's visions of glory in death but he isn't quite sure who is right anymore. Arthur has killed many people and doesn't see glory in it. Eagle Flies is infatuated with Dutch. Makes sense. Rains Fall asks Arthur to ride with him. He can help with his cough too. Outside the tent a soldier rides up. Captain Monroe spoke with the mayor of St. Denis but the news isn't good. He joins Rains Fall and Arthur who mount up. Follow Rains Fall to a sacred location. Monroe says the oil companies already got approval to drill on the reservation. He asks Arthur if he can provide help in the future. Accept or decline. If you accept, Monroe tells Arthur to meet him on the reservation whenever he can. If denied Arthur says he has too much going on already. Either way Monroe rides off. Keep following Rains Fall. He knows some herbs that can help Arthur. Up ahead two wolves are seen feeding on a dead horse. Rains Fall says brutality and beauty are all around them but some can't see past their own grievances. You can shoot the wolves or Arthur will scare them off as you ride by - the preferred method of Rains Fall. You can ask him about Eagle Flies or Dutch to pass time during the ride. Both seem to be turning down bad roads. Rains Fall collects herbs along the way - English Mace and Ginseng - to give to Arthur. You can then talk about the reservation or Arthur's son. Arthur had a son named Isaac born to a waitress named Eliza. Arthur was trying to do good by them and visit often but one day he showed up and they were dead. They were robbed and shot over $10. The pain hardened Arthur. Why live a good life if bad things will happen to you anyway? Next up for conversation is Captain Monroe or Arthur's sickness. Arthur knows there isn't much anyone can do for him but maybe he can help his gang get to freedom. Up ahead is Rains Fall's sacred location. They arrive to find the site burned down. Rains Fall is upset and asks Arthur to look around for a ceremonial pipe called the Chanupa. Search the area for clues. Use Eagle Eye to help spot them. There are bottles of alcohol strewn around. They couldn't have gone far. Looking from the cliff, smoke is seen down below. Use Arthur's binoculars to look around the cliff edge. Some of Colonel Favour's men are at a campsite. Rains Fall laments all the treaties he has signed that the Army has broken. His people will want a war. Arthur offers to get the Chanupa back. He'll do it quietly too so no one has to get hurt. Rains Fall has no money but Arthur doesn't need any. Go down to the camp. You can sneak in and out with the Chanupa, stealth kill some of the soldiers, or go in with guns blazing. There are six soldiers. Two are at the campfire, one is sleeping next to them, one is at a tent nearby, and the other two are patrolling. The sacred items are at a tent right behind the two at the campfire. There is a chest next to them that has jewelry and a pamphlet about poison arrows. A few other loot items are around the camp. When you have the items, return to Rains Fall back up top. He is sitting in front of the burned tent. Approach him and Arthur hands over the sacred items. Rains Fall is grateful and hands Arthur an Owl Feather Trinket. He also reminds him to take the herbs given. Rains Fall walks away as Arthur inspects the ruins. Writing in his journal, Arthur says not long ago he would have thought Rains Fall was weak. Now he sees him as wise. Hopefully Arthur can help or at least stop Dutch from making Eagle Flies do something stupid. 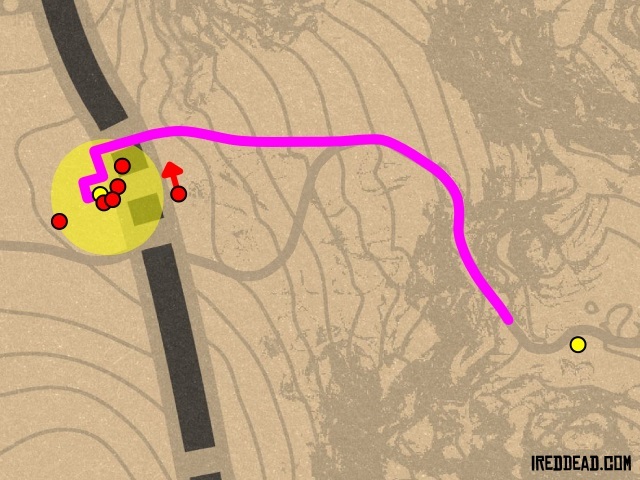 The timed objective is for getting to the campsite and grabbing the items. Follow the purple path above. When you get to the sacred location, get back on your horse and position it below the cliff just past the site. Try to be north of where you end up standing. Go back up onto the cliff to trigger the binocular action. When allowed, put the binoculars away and quickly go down to your horse to ride to the soldiers' camp. Ride towards the northern edge of the camp but stop at the end of the rock slope near some boulders. Dismount and crouch/jog along the north side. The patrolling soldier may hear a noise and go looking towards your position but keep going. After the first tent enter the site and sneak around to the campfire from the right. Grab the items and sneak back out the way you came. The soldier in the tent will move towards the fire but you should be able to get past him. Jog back to your horse avoiding the patrol soldier. You may need to go a little far around to avoid him. Once you are on your horse ride back up to Rains Fall. The patrol soldier will always hear something. You actually want him to hear you outside of the camp or else he'll come inside and spot you. In a similar manner, if you stealth kill the patrol soldier the ones in the camp will perk up. You can still sneak in and take the items as normal if done on the way in. Avoid this to get the items in time.